#9 seed Terriers have returned to South Bend, Ind., to take on #8 Notre Dame in a first-round Hockey East playoff game. Puck drop at the Compton Family Ice Arena is 7 p.m. ET. BU, which was blanked twice by the Irish two weeks ago, is looking to extend its streak of at least one in its past 21 Hockey East tournaments. Last season, the Terriers reached the conference title game, losing 1-0 to Lowell. BU is led by freshman Robbie Baillargeon with 25 points, sophomore blueliner Ahti Oksanen with 23 and sophomore Danny O’Regan with 22. Matt O’Connor gets the start in goal in this win-or-go-home contest. TJ Tynan paces Notre Dame with 31 points and Mario Lucia has 15 goals. BU will be looking to put some pucks past Steven Summerhays, who has the sixth best GAA in Division 1, 1.87. 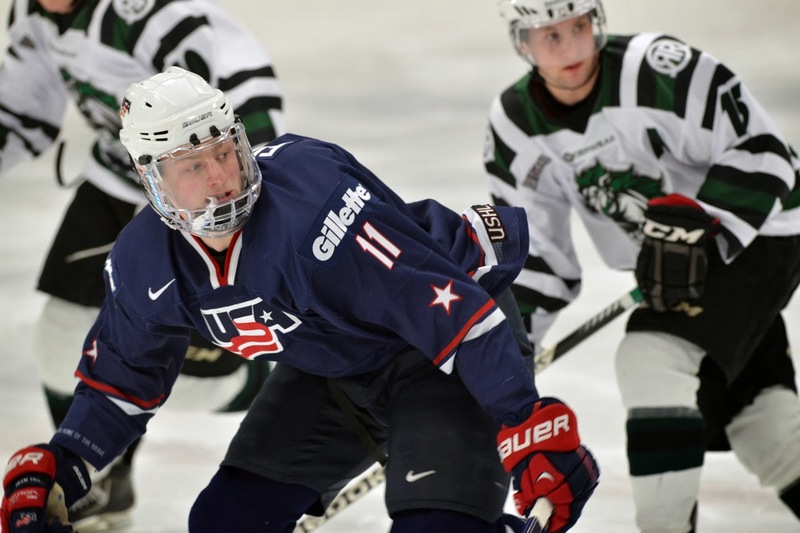 2014 recruit Jack Eichel scored a goal and added two assists—including setting up the game-winner less than two minutes into overtime—as the NTDP U18s rallied past Cedar Rapids, 5-4. The tally was his team-best 31st of the season for the center from Chelmsford, Mass., giving him 60 for his career and moving him into 10th place in the all-time NTDP record book. Eichel now has 66 points in 38 NTDP games. With his fourth consecutive three-point game (6-6-12), he has now scored in the past 12 games and 27 of the past 29 games. Earlier in the day, Eichel was the subject of rumors that he might consider foregoing college if he could play in the OHL and go “head-to-head” against Canadian Jr. star Connor McDavid. A tweet from TSN’s Bob McKenzie launched the frenzy. Later several articles suggested that this is unlikely as Eichel’s CHL rights are held by St. John of the QMJHL, whose GM said he’d never let him go to the OHL. 2014 recruit Ori Abramson scored his fifth goal of the season for the Jersey Hitmen in their 5-1 defeat of South Shore Kings in the USPHL Premier division best-of-three semifinals. The 6-5, 220 lb. defenseman from Toronto has a 5-23-28 in 45 games for the Hitmen, who can advance to the finals with another win. 2015 recruit Bobo Carpenter assisted on Austin Prep’s first and third goals as the Cougars eliminated Central Catholic, 4-1, to advance the EMass Super 8 semifinals. Second seed BU takes on #3 seed Northeastern in the Hockey East tournament semifinals at Hyannis, Mass. Game time is 4:30 p.m. The Terriers and Huskies played three times this season with BU winning twice, both times on the road. 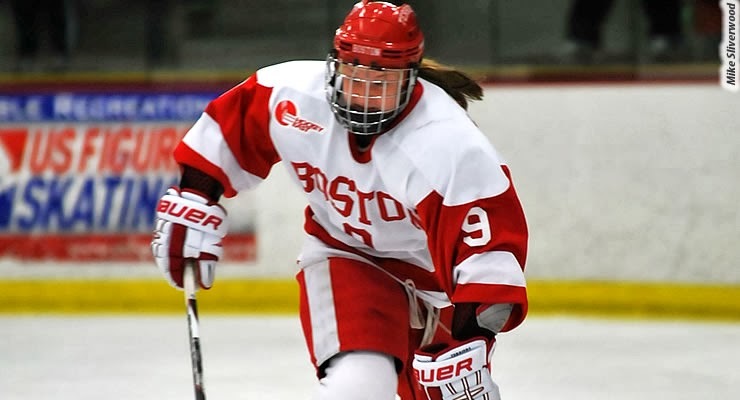 BU, which carriers a streak of seven consecutive conference tournament wins into the game, are led by Division 1’s top goal-scorer—and Hockey East Player of the Year—Sarah Lefort , who has a 30-23-53 scoring line. Senior captain Louise Warren is 10th in the nation in scoring with 45 points. Goalie Kerrin Sperry is BU’s career leading in wins and carriers a 1.56 GAA in Hockey East tournament games. If the Terriers win today’s semifinal, they’ll play the winner of BC-Vermont in Sunday’s championship game. Yesterday, Lefort was announced as the unanimous pic for Hockey East Player of the Year. The Patty Kazmaier Memorial Award finalist, who made all-rookie last season, is joined as a conference first-team all-star by Warren and senior blueliner Kaleigh Fratkin. Although this was one of the most disappointing seasons we've experienced in many years, I am proud of how our Terriers fought back after being down 2-0. It was a very exciting and entertaining final game. With Eichel coming to Agganis in October, there's much to look forward to for 2014-15. Even the UND announcers commented on our incoming freshman class.